Since 1888, Charles Schwartz & Son has been buying and selling the finest vintage jewelry in the Washington D.C. area. The vintage jewelry experts here at Charles Schwartz & Son make the buying and selling process a breeze! Our knowledgable staff of vintage jewelry experts will evaluate your vintage jewelry and family heirlooms to offer you the highest possible price, while treating each and every customer with the utmost care, professionalism and confidentiality. 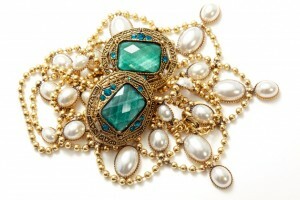 A piece of jewelry is considered “vintage” if it is more than 50 years old, but less than 100 years old. Unlike antique jewelry, vintage jewelry is often worn and displayed, as vintage jewelry is less likely to break due to its relatively young age. As many vintage designs are still in tune with many modern trends, vintage jewelry has become the ideal choice for making unique fashion statements or adding a little contemporary flair to an outfit. To learn more about vintage jewelry, along with the unique time periods that shaped them, visit our Jewelry Education Section. With over 125 years of experience in the Washington DC jewelry industry—you can trust Charles Schwartz & Son to consult on any and all of your jewelry-related needs! For additional information, or to schedule an appointment to sell your vintage jewelry, contact us today to set up a consultation.